Highlights: The fourteenth meeting of the Conference of the Parties to the Basel Convention (BC COP-14), the ninth meeting of the Conference of the Parties to the Rotterdam Convention (RC COP-9) and the ninth meeting of the Conference of the Parties to the Stockholm Convention (SC COP-9) will be held back to back from 29 April to 10 May 2019, in Geneva. The theme of the meetings will be " Clean Planet, Healthy People: Sound Management of Chemicals and Waste". The meetings will include joint sessions covering matters of relevance to at least two conventions and separate sessions of the meetings of the each of the three COPs. The meetings will not feature a high-level segment. Meetings documents can be accessed from the meetings documents page. The bureaux of the conferences of the Parties to the Basel, Rotterdam and Stockholm conventions, at their joint meeting on 15 and 16 November 2018, agreed to the tentative schedule of work for the meetings. 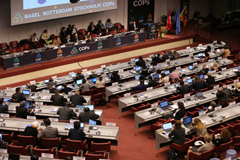 Briefings on the 2019 conferences of the Parties to the Basel, Rotterdam and Stockholm conventions can be accessed on the briefings page.